The Frenchman's Food & Wine Blog: Sentinel Bar & Grill, Corner St George's Terrace & William Street - close to perfect! Sentinel Bar & Grill, Corner St George's Terrace & William Street - close to perfect! Given the traditional slow week in the first week of the new year when many of the Perth office horde are still away on leave, I jumped at the opportunity to spontaneously lunch at Steve Scaffidi's new restaurant, Sentinel Bar & Grill, without the need for a booking. It's located next to the AXA building at the corner of St George's Terrace & William Street. I never thought I would say it of any restaurant, but this is close to perfect! In the fashion of Steve's other venture Bar One, Sentinel is divided into two - a bar area with high bench tables, and a more intimate section comprising rows of booths. The style of dining is kind of bistro with a more adventurous, sophisticated food selection than you would expect from the average bistro. There were a smattering of patrons, most of whom were having beers or coffees: a bunch of toecutters in one corner discussing repossessions of corporate jets and luxury yachts, a couple in the other corner who still appeared to be on holidays, and two girls who could have been outside clerks having a cheeky drink in between jobs. The service was top notch - both Angus and Alex were unobtrusively attentive and polite - no snooty service here (not that there's anything wrong with that, but this isn't the place for it), and I never had to wait or risk whiplash to try to get somebody's attention. But it's the food and its presentation that really impressed me. There was a tapas menu that not only had the usual suspects like french fries, a Waldorf salad, and an omelette, but also black pudding! Woot! Hey - I hear you gagging. But don't knock it till you've tried it. Remember my post on The European in Melbourne? The freshly cut bread was crusty but not hard, with a warm, soft inside. The butter was perfect - cold enough to hold its shape, but soft enough that you didn't need to apply pressure to cut through it. It spread beautifully and thickly on the bread. Don't you just hate it when a restaurant serves you butter straight out of the fridge and you have to virtually maul the poor slice of bread with the knife to spread the rock hard butter on? Well I do. Anyway, onto the food. I ordered the $50 two course lunch special - you get 2 choices for each course. 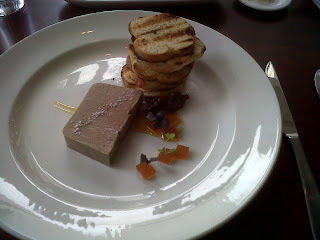 Entree was the duck liver parfait with calvados jelly, and it comes with a stack of lightly toasted mini blini-like, slightly crusty things. Yeah not my best prose, but they go well with the liver and jelly. There's a very generous serve of duck liver - it's almost a light meal in itself - which has a delightfully smooth texture, with a thickness halfway between mousse and pate. Tasty. My main was the poached spiced lamb rump with baby leeks, broad beans and broth. The broth made this dish reminiscent of my meal at Gordon Ramsay at Claridge's some years ago, and it was light and flavoursome. Broad beans provided a nice crunchy textural accompaniment, and the baby leeks were intriguingly delicious, looking like fat spring onions. 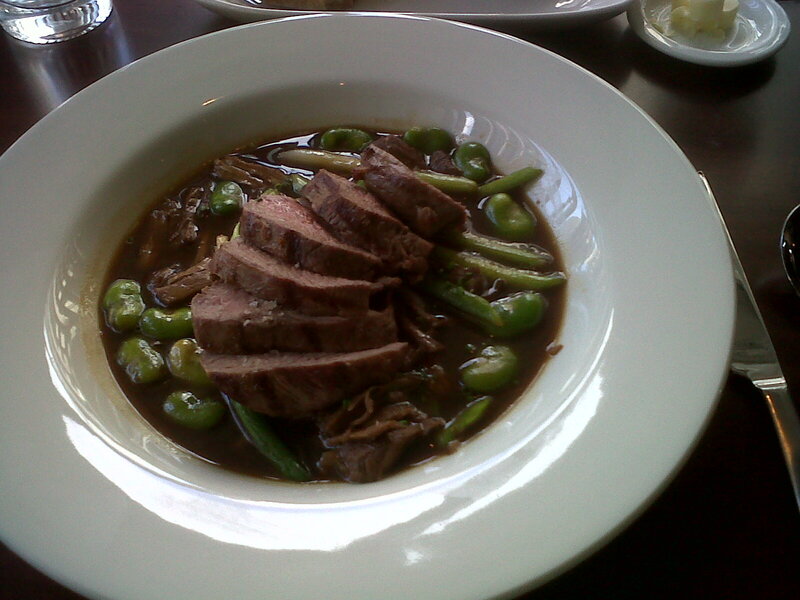 Their piquant flavour nicely cut through the stronger flavours of the lamb and broth. And then we come to the medallions of lamb, still joined together and fanned out atop the bed of the other stuff. When I cut through it, I was surprised to see only the slightest hint of pink. Being used to eating lamb medium rare, this left me a bit bemused. The next surprise, though was the tenderness of the meat. Truly the poaching had done its job! But the real highlight was the flavour. A backbone of lamb-y (what?! that's the easiest way to describe a lamb flavour isn't it?) overlaid with exotic spices that you could almost smell from within your mouth. Now this is TASTY. Washed it all down with a nice red Rhone (Plan de Pegau), which had a surprisingly rich and robust cherry-like flavour, which suited both the duck and lamb perfectly. This meal left me full, with a slightly tight belt, which in my book is just right - generous serving sizes, but not to the point of making you feel like Mr Creosote. I could certainly have fitted in a chocolate mint, wafer-thin or otherwise, without any explosive consequences. Nothing is ever perfect, but this has got to be pretty close. Excellent service, nice wines by the glass, good presentation (check out the pics), great food, and of course, soft butter. Do yourself a favour - check it out for yourself.